A host of programming is planned to celebrate the new academic year at Indiana University of Pennsylvania, and to welcome new students into the community. Activity on campus is ongoing in preparation for the move-in of new students August 25–8, and for continuing students on August 28. The first day of class for the fall semester is August 29. On August 26 at 9:00 a.m., IUP president Michael Driscoll will preside over the “Opening of the Academic Year: 2016–17” in the IUP Performing Arts Center’s Fisher Auditorium. The program is open to the community. The day’s events continue with a picnic in the Oak Grove from 11:00 a.m. to 1:00 p.m. Picnickers may purchase food from Aramark in the Oak Grove or bring their own lunch. Cost for fill-your-plate picnic items is $7. In case of inclement weather, the picnic will be held in the Crimson Café. Freshman Convocation, the event that formally welcomes new students to the university, will take place Sunday, August 28, at 5:00 p.m. at the Kovalchick Convention and Athletic Complex. Speakers will include President Driscoll; David Downing, IUP’s 2016–17 Distinguished University Professor; Timothy Moerland, provost and vice president for Academic Affairs; and Melvin Jenkins, chair of the Department of Developmental Studies. Move-in activities on campus officially began August 14, as approximately 100 students working as community assistants and academic success mentors for the Office of Housing, Residential Living, and Dining arrived at the university in addition to approximately 100 students on the football, soccer, and volleyball teams checked into the residence halls. On August 20, approximately 400 new students participating in the university’s College Undergraduate Success Program Early Entrance Experience will move into their residence halls. Sponsored by the Department of Developmental Studies, CUSP gives first-year students an introduction to college and a head start on the adjustment process. 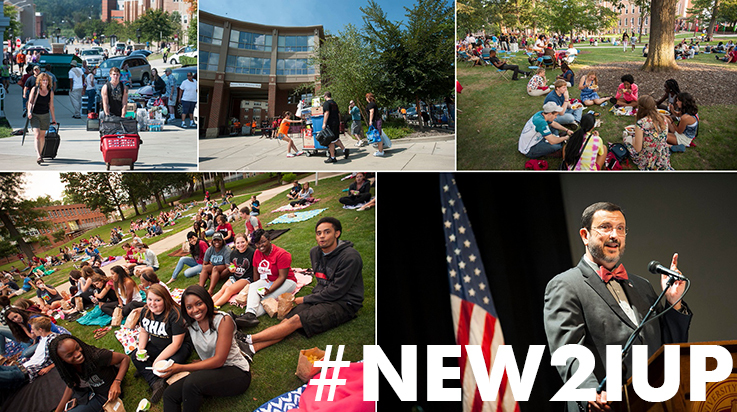 On August 22, more than 120 new international students will arrive on campus. Each year, IUP hosts close to 1,000 international students from nearly 60 countries. New international students will have orientation activities the week before the beginning of classes. On August 24, about 80 new freshmen in the Cook Honors College will move into Ruddock Hall, and approximately 430 freshmen will move into Putt and Delaney halls. All other new and transfer students living in university-owned residence facilities will move in August 24 and 25. The remainder of residence hall students will move in August 26 from 9:00 a.m. to 9:00 p.m. Approximately 250 students will move into residence facilities at the Punxsutawney campus on August 21. Close to 4,000 students live in on-campus housing at the Indiana and Punxsutawney campuses. During freshman and transfer student move-in, a number of bottled water stations will be set up on campus for students, parents, and move-in workers. Water is being provided by IUP Greek organizations. IUP officials have been making community residents and merchants aware of move-in day and the anticipated traffic associated with the event. Students have been given staggered arrival times, indicated on dashboard tags, so that move-in activity is spread throughout each day. As in past years, arriving students and their families are directed to a staging area in the Miller Stadium parking lot and will be released from there to the appropriate building. Roughly 200 volunteers, including members of student organizations, will assist as movers. IUP police officers, faculty members, and student workers from a variety of offices are active throughout move-in days to help make students feel welcome. In addition, some 120 community assistants, academic success mentors, and graduate and professional residence hall staff members will work inside the residence halls to greet and assist students and family members. Professionals from the Office of Public Safety, the Center for Student Life, and the Office of Housing, Residential Living, and Dining begin developing move-in day procedures, signs, work schedules, and publications during the spring semester of the previous year, according to Valerie Baroni, chair of the IUP Move-In Committee.